Fun Dip: What kind of a mad genius came up with this? Edible dipping sticks and multi-flavored powder in individual pockets. It just seemed like too much trouble when I was young – which is exactly why I picked them up. What better way to instill children with a work ethic? Either that or really annoy them. Win win. Cigarette candy: I thought this stuff was outlawed! How politically incorrect. I mean, how could I NOT hand this out to those impressionable little tykes. They’ll be the coolest looking kids in the schoolyard. Blood Suckers: No idea, but vampires are hot. Surprisingly, no tie-in treats for similarly hot commodities like zombies and Chilean miners. Sweet Tarts: I only picked these up because the guys at work like them. Don’t repeat that. Bottlecaps: I loved these as a kid! Root beer, please. I always kind of wished they’d make Fresca as well. Pop Rocks: I’ll dispense along with some sound advice – well, actually, more a completely baseless urban legend of the kid who ate them while drinking cola and blew his head off. Awesome. Nerds and Razzles: No idea. They just sound Halloweeen appropriate. I wouldn’t be surprised if they were the same thing. Variations of the sour theme: This stuff is truly horrid. So I figure the kids’ll love it. Needless to say, these’ll be the first to go. Next Article November 1, 2010: Snow Monkeys, Zombies, and Louis Ferreira! My kids love Fun Dip and Nerds. You’re right about the work ethic. My older son always asks for a bowl to put the powder in when he’s eating them. Oh, and root beer Bottle Caps. Those are the best!!! I can’t remember having any other flavor–always used to ask for root beer. How many trick or treaters did you have?? We had a bunch. Nerds and Razzles….so not the same thing! Bottlecaps – gross. I always made my brother eat them. He loved the rootbeer, too. Fun Dip is great if you ignore the candy sticks. Yuck! Just eat the powder and turn your tongue ghoulish shades of green or blue. Next year, I don’t think I am giving out candy. I bought a 5lb bag of Hershey bars, and only three kids came to my door. That was a big improvement over last year when only two kids rang the doorbell. I think I wound up eating half the bag myself… and I am trying to eat healthier!!! Having leftover candy is had for my motivation!!! I love the chocolate cigarettes, they would be my first choice. I haven’t liked Sweet Tarts since I carried a lunch box. I did love that we could pool our nickels and buy two big round Sweet Tarts, snap in half and then into quarters to serve 8 little runts waiting for the van to go to scouts. Sweet Tarts, the candy of the proletariat. I finally watched A Prophet this weekend and it was really good; like a French Grand Theft Auto come to life, set in a prison. It’s by the director of De Battre Mon Coeur s’est Arrêté , good stuff. For non chocolate candy,not bad. I did the yard up (Roman Centurian, Spaceman, decapitated firefighter, myself in cloak and mask and posed with a sword) and allowed kids to grab candy by the handful. City tried a party in the park thing to keep kids from going door to door. What it did was delay hoe kids and their parents until 8pm, the time I usually shut down. Was packing away stuff but handled the extra traffic well enough. Looking forward to hearing about your sharing the leftovers at workj. Two more months and we’re through another year…..
Ohh,loved those candy cigs, didn’t think they made them anymore, let alone being outlawed, yum. I am going to your place for treats, maybe some truffles too. We live in an area that never has the kids, so I make sure we have candy that we like, coz it will be here tomorrow, but not long after that. Gosh I love halloween! Do the pups get dressed up for it at all? I miss Fizzies. Do they still make fizzies? Candy cigarettes, I loved those, haven’t seen them in ages. I got trickers last night, but this is Utah, so it isn’t surprising. The churches hold “Trunk or Treat” where the ward members hand out candy in the parking lot. They decorate the cars and have games. So safe, so dull. I think kids need to learn how to navigate in the dark, plan the best route, dodge the big kids and enjoy the thrill of standing at a stranger’s door. Free range kids are hardier, smarter and savvy about the larger world. I have a bucket of cheap foil wrapped chocolates which look like body parts, some Nestle crunch bars, and a bunch of tiny Butterfingers. I’ll freeze them for MyLarry, he can take them on the truck when he gets back in a couple weeks. Except the Butterfingers. All Futterbingers are mine mine mine. Alas, I am a trucker widow just now. I’m already lonely. We had zero knockers on our door. Woohoo!! The supermarkets keep trying to make it a big deal here in Australia – but most of us have not fallen for it yet. Oooh, I miss Fun Dip. When all three sections were low, i’d separate the paper so I could mix them all up. My poor tongue felt so weird afterwards. Personally, I’m using out at Halloween, busy in all. However I don’t really eat Candy, so when it comes to Halloween, if anyone comes its normally just Chocolate given out, if you have expensive taste well bars are okay. Speaking of Candy, a while back I bought a weird Japanese Candy thing, basically they went through all the effort to mimic a classic Japanese fish catching game, complete with a small paper catcher thing and flavored water with the candy. Really odd, just It seemed well random. Japan has the most random candy. Don’t buy candy, turn off all the lights and hide out in the back room till all the little kiddies are gone…then tomorrow morning rush out and grab up all the 50-75% off mini-sized chocolate treats we can find! Works like a charm. The kids get the tricks, and we get the treats. Fun Dip – The pure sugar stick was the best part! I always gave my brother the tart powder and just kept the sugar lick. Bottle Caps – guess it was almost unanimous, we all loved the root beer the best. Nerds are *not* Razzles, my friend, not even close. As someone who has a small, novelty Razzles pillow on her bed, (and I quote)”First it’s candy, then it’s gum”. Nerds are just little hard crunchy tangy sugar blobs. (I work for the company that makes them, and a couple of the other items you listed). What happened to the repair bot on Destiny? Is it still going around fixing stuff or have we seen the last of it? 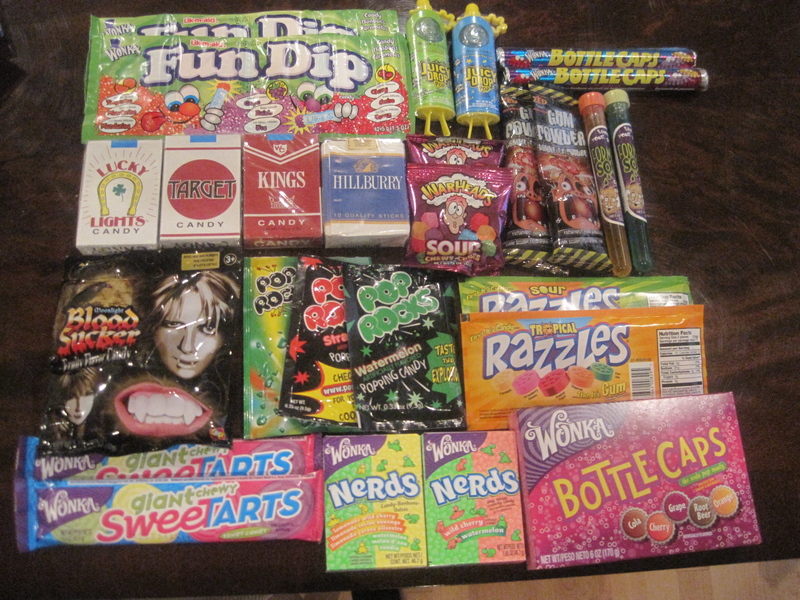 You forgot Pixie Sticks…It’s not Halloween unless you try to hork up a lung because you accidently inhaled the powder. We didn’t have as many trick-or-treaters this year as we did last year. At 8:15, when I thought that was it for the night, I gave the last kid 17 packages of Skittles (full size packages), the end of my stash. Then 4 kids showed up 15 minutes later so I had to break open the box of Mini-Oreos I use for Patrick’s lunch. I decided not to turn the light off; wanted to be sure the kids had a good place to navigate safely out of this area. In the middle of watching an excellent episode of Dexter at 9:30 we got a ring at the door. You would have thought it would have been teenagers rudely ringing the door after 9:00, but it was 2 preschool kids. They also got a bag of Mini-Oreos. Pretty boring Halloween. Patrick dressed up as a rock star. Tried to make him look like Adam Lambert, but he looked more like Billy Idol with brown hair. I’ll post the picture on Twitpic soon and send a link. P.S. No tricker treaters this year which is a first… More candy for us In hindsight I probably could’ve turned the porch light on… Nawww. LOL. Happy Halloween to One and All! You can decide amongst yourselves who ‘One’ is and who ‘All’ are. Joe, I bought my very first house on Friday! Hooray for me. I would say I built it, but that would imply that I physically built it. Instead I had it built just for me. I’m suffering from a fair amount of cabinet and countertop pride and am vain about my master bath and flooring. I have become THAT person. This was a five-month-long process, and I am glad it has mostly ended. I move in on Friday. No more climbing the stairs up to my 3rd floor apartment! And I like Nerds, Fun Dip, Pop Rocks, and SweeTarts. I never cared for Bottle Caps. I also always wanted one of those lollipop rings when I was a kid. Over the years I’ve noticed that the neighbors with the most kids never turn their lights on or hand out candy. Yet they expect others to fork over the candy to their kids. So I decided to join my street this year and not turn my porch light on. Peeked out the window a couple of times and saw groups of kids wandering down the street, walking by all the dark homes. Kinda felt sorry for the little buggers. Kinda. I only bought a couple of bags of miniature chocolate candy – Hersey bars, malt balls, reeses bars, kit kats, kisses. Not for them, for me! I’ll take about 3-4 with me each day to eat at work when I need a “fix”. Love your classical mixture. Brings back memories. The Churches Saturday night and tonight held Trunk Or Treat for the Kids with food and games and rides. Some Kids went trick or treating but most went to churches and had their Halloween. I have been an ardent viewer of the Stargate franchise since the very first movie (with Kurt). In SG1it was mentioned that the Stargates are made of a rare element called Naquadah. In SGU, the seeder ships are mentioned to be manufacturing the stargates since many million years. From where are the seeder ships getting the rare element required to manufacture the stargates ? Surely they are not carrying all the required quantity !! We had 2 boxes of 95 piece assorted candy and a box of 50 fun dips, we have only 10 fun dips left and thats cuz I hid them! Hey did anyone pick the Raiders in the reverse pool, they are steamrolling everyone!! I watched the premiere of The Walking Dead and it was good, I have been watching alot of HBO and AMC recently, they got some really good original programing. Easy way to get less trick or treaters is to get a house in a nice expensive but quiet area where there’s not as many neighbours on the street. It works. Anyway all this talk of Candy, fortunate I don’t eat much, or much Chocolate either, it can ruin your figure. I kept mine! Interesting Halloween comments from people anyway. Ha! There’s a reason the families with the most kids turn out their lights and don’t answer the door! They’re out trick or treating! At least we are. Joe, your candy stash makes me laugh. My sons would have loved it. They love all things sour, and I even have one kid who doesn’t like chocolate. I swear someone switched bassinets at the hospital. Whenever I see Fun Dip I try to sneak it away into the trash before they can get into it. That stuff is evil, it gets everywhere. I’ve seen Cigarette candy at old country stores. Kind of lost my taste for those things after my dad, FIL and MIL died of smoke related illnesses. I haven’t seen Pop Rocks for years, though! Does anyone remember those little coke bottles or the plastic lips? Used to love those! We had a bunch of kids this year. We moved over the state line into Mississippi a few years ago. The kids are much nicer here. After we would run out of candy in Memphis, we would have to turn off ALL the lights and unplug the doorbell! The culture is different over here and we only moved 7 miles! Das: hubby was talking about the Tingler and then we were both surprised to see it playing this weekend! Slow Halloween here, too. Probably because it was a Sunday and here in the land of Wheaton College and Billy Graham, some folks think it’s just not right to participate in a heathen celebration on the Sabbath (if at all). No sense of humor. Luckily, I took my kids’ advice and got candy that they like, so no worries about the leftovers.